FloorScalesDirect.com offers a full range of 4x8 industrial floor scales for sale. 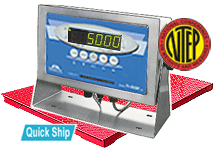 Our 5000 lb floor scale packages include an NTEP certified self-leveling weighing deck along with a digital indicator and the cords and cables to connect the system. The 5000 lb floor scale is outdoor-rated and factory calibrated for ease of setup and to provide the highest accuracy readings. Make warehouse shipping and receiving easy while you weigh skids, pallets, drums, and containers. You can also rest assured that your investment will be protected by the built-in overload protection that comes standard on our industrial floor scales. Take advantage of our free shipping on orders across much of the U.S.A. and look for our “Quick Ship” feature which sends your order out by the next business day. Browse the selection of 5000 lb floor scales for sale at FloorScalesDirect.com today and find the ideal industrial-duty floor scale system for your business.